But wait! It must be something in the air; several other monarchs have had the exact same idea. You must race to get as much of the unclaimed land as possible, fending them off along the way. To do this you will hire minions, construct buildings, spruce up your castle, and fill the coffers of your treasury. Your parents wouldnâ€™t be proud, but your grandparents, would be delighted. a wonderful card game that never plays the same way twice. strategy on how to spend your points to gain more cards, money and land. great game for beginners. introduction of expansions increases the complexity of this game. a must have. This game is great because of all of the different combinations of cards that can be used. Even with just the base game, it has a lot of replayability. It's a lot of fun setting up your perfect deck to enable you to use the best combos, but at the same time you can't lose sight of gaining more money and balance that with obtaining the all-important victory point cards. This is an excellent fast paced card game. It is rare that you would play the same game twice with the variety of kingdom cards and it is fun developing new strategies based upon the cards available. This is an extremely solid game. Dominion might just be the best middle weight game out there. It will absolutely appeal to your wife (or hubby!) and your non-gamer friends. Easy to learn mechanics, each game is completely different, and lots of strategy make this game one of our most played. Enjoy! A fun card drafting game that makes you change your strategy based on the decks you choose to play. Because of the mixing and matching you can get a lot of replayability out of this game. You can play on easy mode or harder mode just by swapping in a few different card sets. Plus there are 4 expansions which add even mor e to it. Highly recommend this game. The game that is taking the world by storm. With expansions coming out at the rate they are, you may never have to play a different game again. And for some people, that might be ok. This is SUPER popular. And for good reason. It's fun. I personally don't need to play it as much as some people, but everyone should at least try it. Probably the biggest new game system in the last few years. Simple card game guaranteed to appeal to a majority of players. Card drafting at its best and an impossible number of combos create a fresh feeling every time. A great card based game wich invlolves a great deal of strategy, but is easy to teach. Lots of cards provided allow for a different game every time! This is a great game! It kind of scratches my old Magic the Gathering itch without having to collect individual cards - just a one time purchse of a box of cards. My wife loved it which makes it even more fantastic. The game is different each time depending on the set of kingdom cards that come out. Throw in a few expansions and the combinations are almost endless. I love trying to build up the winning combination of cards. I've played nearly every deck-building game out there and I still come back to the clean, well playtested beauty that is Dominion. It is the first deckbuilding style game and its smooth and balanced play remains the best the genre has to offer. Dominion is a great deck building game. It gives a lot of replay value with all of the different cards, and each game can be very different because of the card combos. It also has a good depth of strategy without being made overly complicated. Great game! This game effectively bridges the gap between gamer's and non-gamers, with simple gameplay but plenty of complexity in the many possible card combinations. Great for people who like collectable card games, but wish to play more casually. I had heard nothing but good things about this game and I was not disappointed. 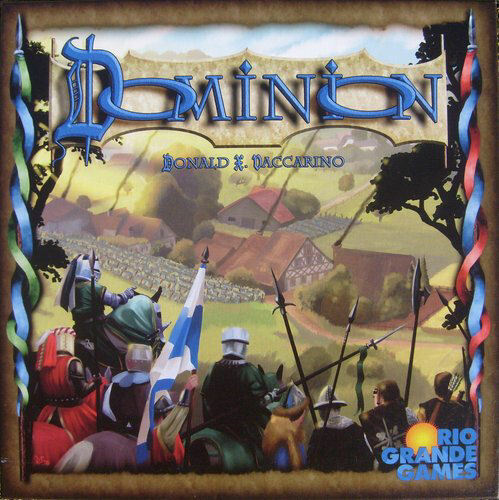 Dominion offers tons of replayability combined with a fast pace and interesting decisions at every turn. Its hard to imagine a gaming group that couldn't find a place for this game on their table. Dominion is an extremely popular new card game with the interesting mechanic of using one's deck to buy cards to add to this same deck. At the end of each player's turn, the deck is reshuffled with the new cards and another hand dealt. Having the right cards in the right proportions in the right stage of the deck's development is the key to success (as well as a little luck when drawing your hand!). Each game takes under an hour - the box suggests even less - and several games can be played in quick succession. What's better, only 40% of action cards are used in each game of Dominion, which leaves a huge amount of room for variability between games. Once you feel a mastery of all these decks, Rio Grande has already produced four expansions on the game. A genuinely great little card game, deceptively deep. The large amount of cards ensures few games will play the same. This game is so good it single-handedly launched an entire genre of games. The first time I came across this game, it didn't really catch my attention since I'm not really big on collectible card games. However, after giving it a try, I can say that I've been bitten by the Dominion bug real badly. This is definitely one of my favorite games! There's so much replayability value! I love trying to find out which card combinations will work best to optimize my number of victory points. Every game runs fairly quick too, so it's perfect for when you're tired and you just want to squeeze in a quick game. TWO THUMBS UP! Imagine you're on a game show where every player is given ten random ingredients and challenged to cook up the best dish. You choose your ingredients and their proportions carefully and season to taste, and if it tastes like barf -- oh well, you only spent 20 minutes on it, so just have another go at it! Dominion is just like that. I love the feeling of building the perfect little recipe for any situation. It's easy to learn and easy to play (contrast: Race), but the more you might feel like studying the cards and how they work together, the deeper your experience becomes. It really is that good! In fact, it kinda ruined my enjoyment of every other game I own for a long year. Gameplay is relatively simple but possibilities are endless with the array of cards that come in the standard version. Blind-scoring, competitive racing, and huge amounts of variable strategy and card combos available. Not too complicated, while providing lots of options. This game is my family's new gateway game. Even my mom requests we play it!